Submitted by Easyboot Customer, Robin Morris. My partner’s name is Beau. 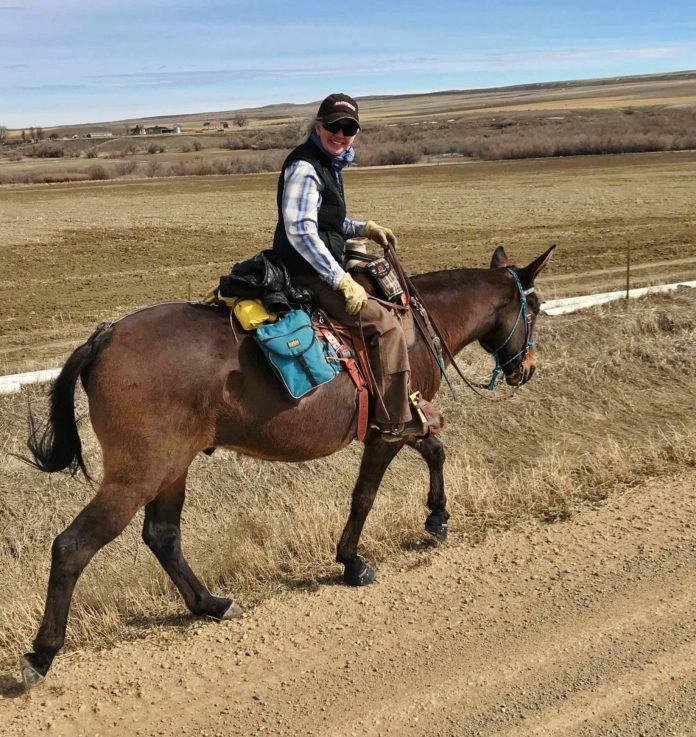 He is an eleven-year-old Quarter Horse Saddle Mule. I absolutely adore him and ride a lot which is probably an understatement. I have logged every mile since the day we became partners on June 16, 2014. To date we have logged just under 7,800 miles. As an active member of our local Back Country Horsemen, many of our rides are in the mountains in Montana and Wyoming wilderness areas. We often travel on sharp rocks to elevations exceeding 11,000’. The terrain is tough on steel shoes. I was wearing through a pair of shoes in under 6 weeks. Through trial-and-error with my farrier, we went from standard steel shoes, to toes and heels, to tapped tungsten rods, and to finally tungsten forged to his steel shoes at the toe and heels. The tungsten shoes are good for about 900 miles, which includes several resets. 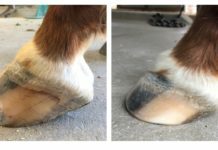 While we have figured out what shoes work best for the trails that Beau and I travel and the miles we put in, his hoof health is important. He is trimmed every 6 weeks year-round. Both my farrier and I strongly believe that an equine’s hooves need a break from steel shoes. 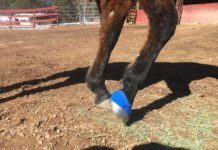 Last winter, during his barefoot break, he got a rock stuck in the collateral groove surrounding the frog, mis-stepped and incurred a minor suspensory branch injury. Wearing a “000” shoe, you can imagine how small his frog and groove are. He was initially on stall rest and then restricted for two months. It was a long two months for both of us. Wanting to still give him a break this year, I was very nervous about going barefoot. On several trips in the Wilderness, several of my riding partners lost a shoe. Having a boot as back-up allowed several of them to “keep riding” while others had to walk their horses out and opt out of following rides. So, this year, I set out to kill two birds with one stone. I researched boots until I was completely confused. Evidently mules are harder to fit as they typically have hooves that are longer than they are wide. Beau’s feet are no exception. After several failed attempts, I contacted Product Specialist, Regan, with EasyCare. I spoke to her about the Easyboot Epics based on several reviews by other mule owners. As soon as they arrived I put them on, took pictures, and I emailed them to Regan. Between her and another Product Specialist they confirmed that the fit was spot on. I was so excited! Knowing that I should break them in on a short ride, I saddled up and rode three miles through deep crusty snow, slick mud and gravel. Beau was short strided for about a quarter of a mile and then fell into his normal stride. After the ride, I completely checked out his pasterns, there was nothing. No heat, no elevated pulse, no rubbing, all was normal. I was stoked! I already had a longer ride planned for the next day with a buddy and felt comfortable going with his new Easyboot Epics. It was amazing how much easier they were to put on the second time! 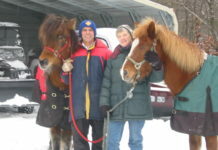 I trailered 38 miles where I met up with my riding partner, Jody, and her Quarter Horse mare, Win-E. The trail chosen was a county road. In Montana, in the winter, you have to get creative about where you can ride. I only bought boots for his front hooves and after 5 miles or so he was getting a little ouchy on the back hooves, so we headed off-road, where I really got to try out the security of the boots on bentonite. Bentonite is a mud that is mined for its sealant properties. Since it provides a self-sealing, low permeability barrier, it is often used for holding ponds. When it rains, you avoid bentonite roads as it takes on a “snot-like” quality that is impossible to drive on, you will get stuck, and is tough to get off any surface if allowed to dry. I was absolutely tickled and impressed that after logging 21 ½ miles not only did the boots stay on, but Beau’s pasterns were absolutely normal upon removing the boots. However, it did take a lot of soaking, brushing and scrubbing to clean the boots. I am so thankful that Beau’s new boots solved two issues: they will carry him through his barefoot break and serve as spares for all of my miles with shoes.